China boasts of being a major economic power. In fact, China’s leader, Hu Jintao has recently set a goal of doubling China’s 2010 GDP and per-capita income by 2020. However, while Communist leaders are obsessed with economic power, it does so at great an expense. Notwithstanding the exaggerated numbers of its financial objectives, there is a statistic that needs to be addressed: the staggering number of homeless children in the streets that some estimate to be between 1 to 1.5 million. The extent of this crisis is compounded by the fact these children represent 1 to 1.5 million broken families since China’s tyrannical one-child policy does not allow couples the option of more than one child. In their frenzy for economic growth, the Communist government tragically ignores the real cause of growth and prosperity for any civilization. The family alone is the economic engine that drives the economy and the moral health of that engine is the key to the development of every aspect of society. By failing to address the break down of families and by limiting their growth, China is simply postponing a crisis that will effect more than just their economy but its society as a whole. One must ask how this veritable army of street children has not led to any outcry from our left-leaning media. No one seems concerned as to what drives these children, the sole hope of their parents, to flee their already impoverished homes to live in utter squalor, subject to abuse, gangs, drugs and prostitution. Communism has always proclaimed that it is for the betterment of the “people” and steals the wealth from rich to give to the laborers and the poor. True to form however, China abandons its most vulnerable members to fend for themselves. 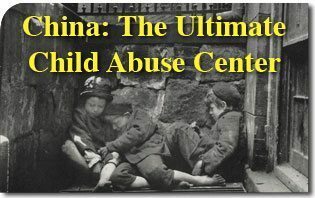 Communist China is the ultimate child abuser, fruit of an erroneous, illogical and evil ideology. Until its anti-natural system is replaced with a tried and proven form of government favorable to the family and private property, China will neither stabilize its economy nor eliminate the plague of homeless children that roam its streets.